Just now an anonymous called me up and he wanted me to pass this money to Nancy the lady who suffering spine and leg pain after he read my one of my post in my blog which I posted (read here) few days ago. I'm not collect any donation for Nancy Tea, I just doing a favor for this Mr. anonymous pass this money to Nancy here. Total amount $1100.00. Last last I got the best answer from one of my friend work in Bandar, He told me she still tahan at the JPMC, so just now after I collected the money I tarus go JPMC and look for her. What cause her become like that? She told me that she was counting money with another teacher in the classroom and suddenly the chair broken and she fall down sit on the floor, then the teacher try to help her up but too bad not enough of strength to pull her up then again fall down again. And this is how it happen her spine yang kana lah!!! I told her that... this are a small amount of money that an Mr. Anonymous want me to pass it to you, although it just a small amount that can help much of you financial problem but we hope that it can help a little bit and wish you recovering back soon. Now the second son jaga her in JPMC, Her husband is a bus driver and the first son temporally jaga the third baby at home! 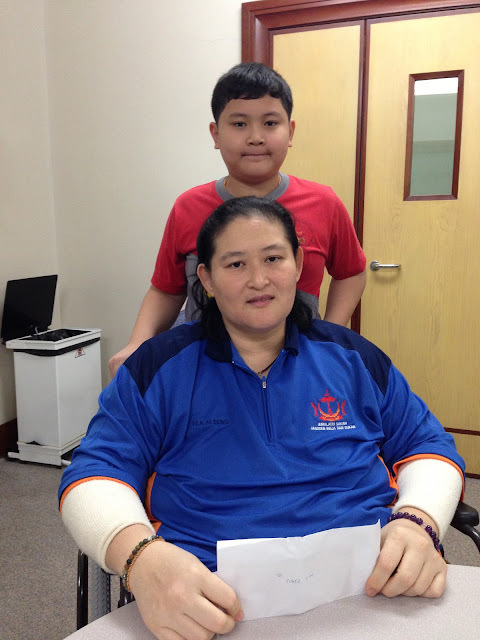 Nancy Tea and her second son received the donation by Mr. Anonymous!!! Right now she only wish for recovering back asap and back to her job. She really need her job back to support her family!!! Hopefully the boss don't fire her! !